Right before the madness of "Carmaggedon" and the frenzy of all the Harry Potter fans rushing to the theatre for the last of the film series, many eager fans came out to Club Nokia on Thursday night to experience one of the most anticipated mainstream Ska shows of the summer- the combination of Streetlight Manifesto and Reel Big Fish.Right before the madness of "Carmaggedon" and the frenzy of all the Harry Potter fans rushing to the theatre for the last of the film series, many eager fans came out to Club Nokia on Thursday night to experience one of the most anticipated mainstream Ska shows of the summer- the combination of Streetlight Manifesto and Reel Big Fish. Although the show did not appear to be a sell out, the level of excitement could be felt from all areas of the large venue. Opening up for the dynamic duo were Rodeo Ruby Love (who I unfortunately missed) and The Maxies. Coming all the way from Greenland, the Maxies came out on stage sporting all red-and-white attire, including their masks. They displayed tons of hometown pride by singing the songs "Greenland is Melting" and "Back Home in Greenland". The Maxies performed pop-Punk music with a brass edge to it;lead vocalist Maximum Maxie poked fun at the crowd and the bands that were to perform later that night, and even called out a fan who compared them to the Aquabats. 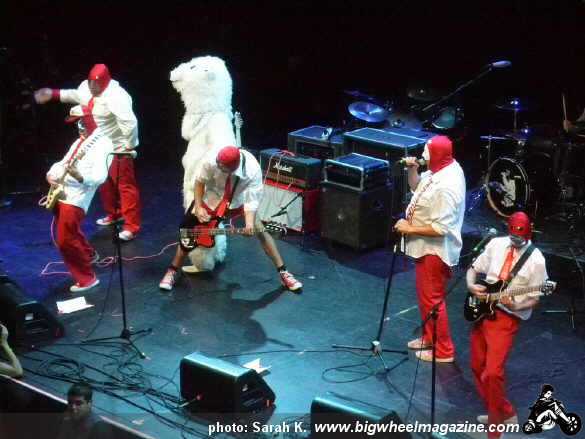 During their set, a giant polar bear came out and danced around stage for a few songs; the bear turned out to be Reel Big Fish's Aaron Barrett, who the band also poked fun at. The Maxies proved to be a perfect fit to open for Reel Big Fish, due to their humor and upbeat music. 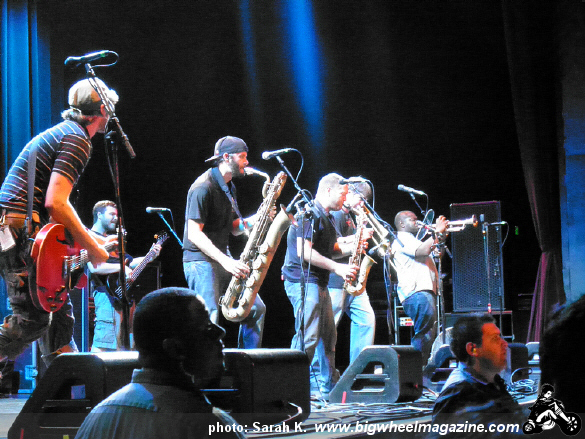 One of the main acts, Streetlight Manifesto emerged to a full, welcoming crowd. They performed their usual set; opened with "Watch it Crash" and played "Down, Down, Down to Mephisto Cafe", "A Moment of Silence/Violence", "We Will Fall Together", "A Better Place, A Better Time", "Failing, Flailing", and a cover of Paul Simon's "Me and Julio Down by the Schoolyard" among other Streetlight classics; although they performed a typical set, they included their version of "Such Great Heights". One of the best things about seeing Streetlight Manifesto, no matter when, where, or how many times you've seen them, they will still perform with a ton of energy and zeal. They closed with "The Big Sleep", and cleared the way for Reel Big Fish. The lights dimmed and the Superman theme began to blare from the loudspeaker, and everyone knew it was time for Reel Big Fish. Though they needed no introduction, they announced who they were and played their hit song, "Trendy". 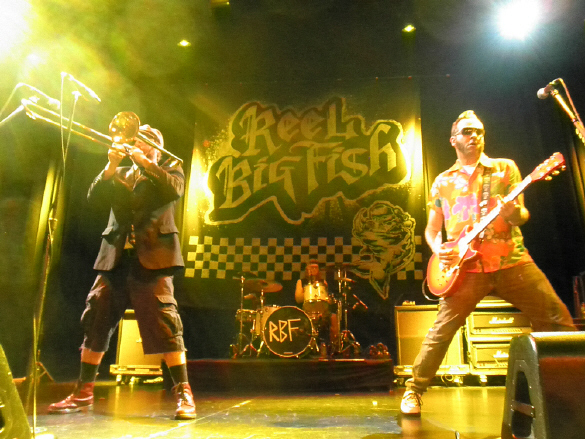 A large pit immediately broke out, and although it wasn't full of much gusto, Reel Big Fish made up for the lack of vitality in the pit. The ska-Punk group had a great mixture of songs, performed rarely-played tracks such as "Cannibal" and "Why Do All Girls Think Their Fat? ", as well as the favorites "She Has a Girlfriend Now", "Thank You for Not Moshing", "Brown Eyed Girl" (which had everyone in the crowd singing), "The Set Up" and "Ban the Tube Top". Lead singer Aaron Barrett maintained excellent crowd communication, making jokes and mocking a variety of topics (one running joke throughout the night was clapping for Streetlight Manifesto a numerous amount of times). One of the highlights of their set was a huge conga line that Barrett demanded during "Sayonara Senorita", which made people make loosen up, laugh, and make new friends. Reel Big Fish then told the crowd that they were running out of time and could only play a few more songs, so they cut to the chase and did their classics- the multiple versions of "S.R." (the original, the fast version, country version-Barrett had us square dance, and the metal version- Barrett had us headbang), and "Another F.U. Song". They decided they had time for one more song and did "Sell Out", then decided to play one more ("Beer"), and "seriously, only one more song", which was a cover of a-Ha's "Take on Me". 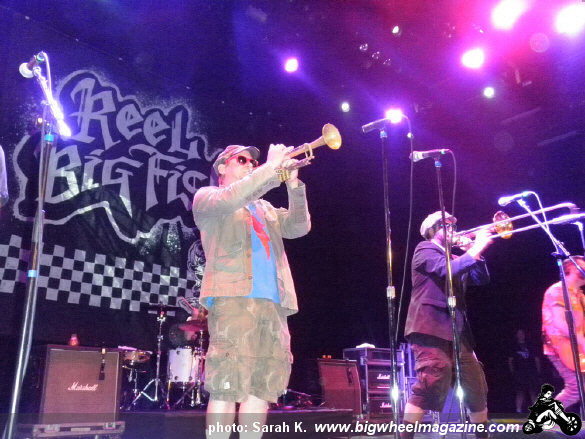 Unfortunately, it really was the last song for Reel Big Fish, and the party was officially over. Whether you came to skank to the sounds of Streetlight Manifesto, or to dance around during Reel Big Fish, no one can deny that both bands gave great performances that complemented each other perfectly.